I’ve been working on our video blog (vlog) intro for a few days now, and I can’t decide which music I prefer for it. Mark and I decided to go with hand-held, quick cuts and a bit more of a vintage look – hence, the 1940’s music on the one intro – and we prefer a whimsical feel to this. But the vid clips are a bit fast paced (I’ll re-create another one sometime soon), so the other music sample may be more appropriate. UPDATE: The winner is below! I think I like #1 the best. Great job on both though! Thanks, Lisa. Dan likes #2 “hands down” – which shocked me. As he’s such the Rat Pack fan and all. Barry, I actually like both. I don’t mean to walk the fence, but it might help to know what audience you hope to attract, appeal too, etc. The first one actually reminds me of an opening to a Big Chuck and Little John sketch. A bit of fun and nostalgia might be why I like one. Knowing this is for a blog, I also like your second choice. To me it sounds as if something a bit edgy is about to be discussed. So, I hope you don’t mind the shared thoughts. Nice job on the choices. Great luck and let me know how the blog progresses. Good feedback, Gregg. Big Chuck & Lil John – yea… I’d say we were thinking somewhat along those lines. Number 1, but I watched that first. Hey Barry…I’m for the first clip + music. What are you going to be sharing in your video blogs? Is this strictly for fun, or is this for business development? Nice hearing from you after so long! Good luck…remember to take the time for a good cookie sometime! P.
Hi Penny. Sorry I missed this post. Just now saw it – only took 2 months. 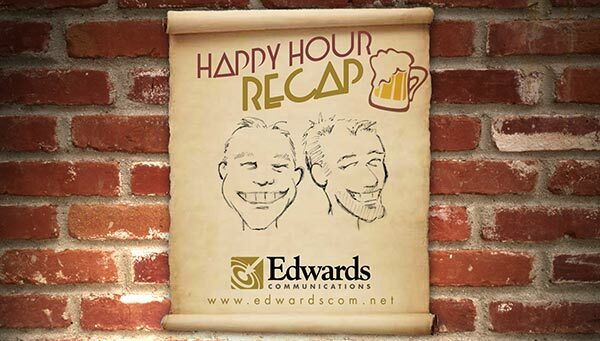 Our Happy Hour Recap is meant to be a quick, informal and (almost) weekly video on web development and content marketing. We’re struggling with making them short enough that people will take the time to watch. And the HH aspect is also to make it seem a bit more fun… hopefully. I just posted our latest, any suggestions are very welcome. And, yes, I need to get some of those cookies! I hope all is well with the wonderful WOW Cookies!